It's hard to see the exact detail from these photos but this skirt is sparkly with gold thread running throughout. It's so festive! However, it's not over the top and subtle enough to be worn past the holiday season. I'm all for special occasion outfits but I get especially excited when I can put together a look that can also be worn after the occasion is over. 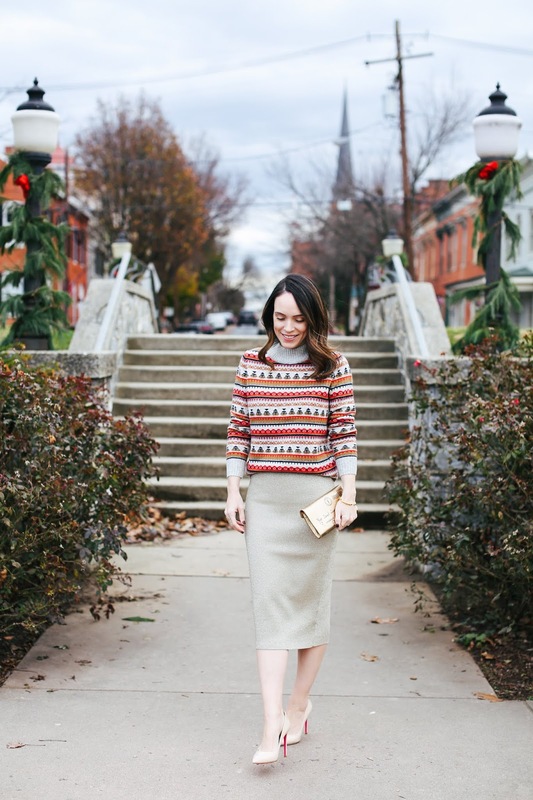 A fair isle sweater is a winter basic in my mind and the gold skirt can be worn with a simple black turtleneck or silk blouse for a non-holiday dinner or event. Together I think they strike the perfect balance of cozy and glam. There is also a matching turtleneck to the skirt but sadly it didn't work for me but I definitely think a monochromatic gold look could be stunning!